When it’s Just too Darn Hot for the Birdbath! Not so refreshing… except for the gentle spray from the leaf mister above! Like the shoemaker’s daughter with worn shoes, our own mister at home is really old with a slight drip. 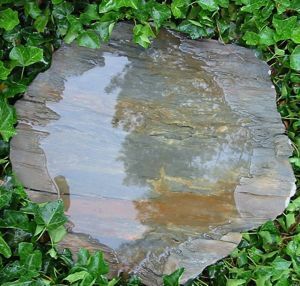 But the drip is ideal over a birdbath as it keeps the water moving (no mosquitoes) and adds fresh, cool water on a slow and steady basis. Birds are absolutely wild for it! So much so, they sit and wait for the misters to start every morning, it’s like a virtual bird spa. This mister is attached to an old metal… not sure what it is, but a simple plastic plant stake with twist-tie works great. Even the garden benefits with ease of mobility, moving the stake around to different sections each day. Gardens grow lush, and birds love taking leaf baths too! 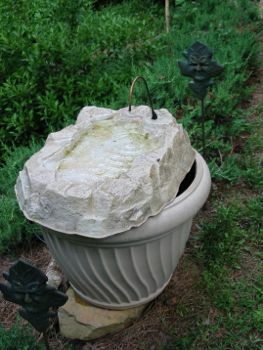 When placed over a birdbath, leaf misters offer fresh and cool water for birds, butterflies and other wildlife. Activity is pretty amazing on warm summer days. Stagnant water is no fun for anyone when temperatures remain in the 90’s. 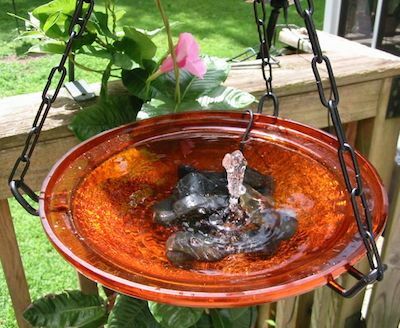 Adding a water feature like a dripper, solar fountain or water wiggler to your birdbath will bring it to life, entice more birds, and keeps water fresher for longer periods of time. The whole set-up is shown below and it’s simple to recreate. The misters come with everything to be up & running in minutes! With 50 feet of tubing, it attaches to the outdoor spigot, complete with Y-valve that keeps garden hose free for use. Extra tubing is optional, and we can promise (from personal experience) birds LOVE these things! July can be a scorcher for wildlife, especially with recent droughts and above-average temperatures. Natural water sources like puddles, creeks and shallow pools all but disappear during summer heat. 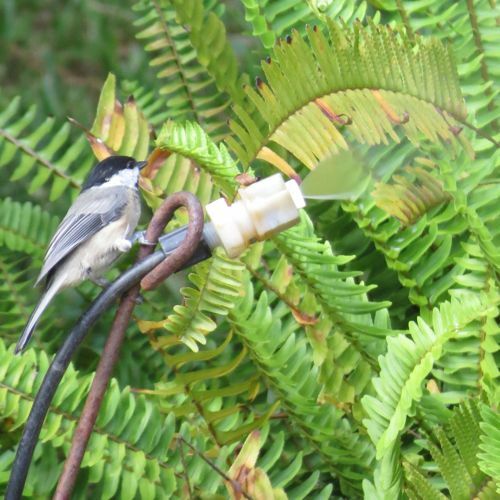 Adding fresh water to the garden may prove to be a life saver for birds and other animals whose habitat continues to shrink. Something as simple as a plant saucer filled with water will see winged visitors happily partaking in the essential life source. 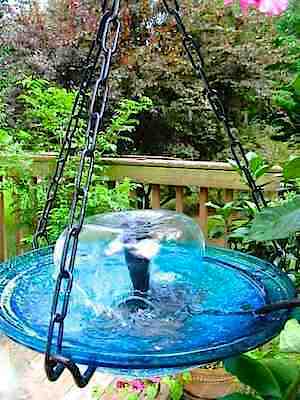 Adding bath accessories like leaf misters, water wigglers, or this solar bubbler can bring a pedestal or hanging bird bath to life! Circulating water stays fresher longer and acts as a magnet for birds! They’re totally attracted by the visual of moving water, and the soothing sounds can be a welcomed addition to human ears as well. No need for the whole set-up either, these battery or solar powered accessories are a la carte! Some even operate from the outdoor spigot. Add them to your existing bath for a whole new dimension in birding. 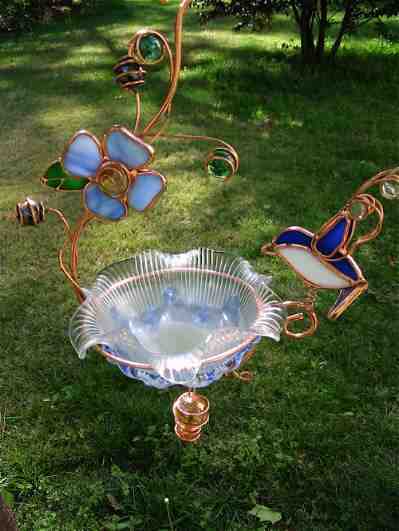 Hummingbirds are especially fond of birdbath fountains, while butterflies covet the gentle spray of leaf misters. Songbirds around our place actually sit and wait for the drppers to start each morning, it’s looks like a bird spa! Consider one of many “moving water” accessories this summer and see which new visitors show up at your place. Especially during spring and fall migrations, you may be quite surprised! You hear it all the time… or maybe not? 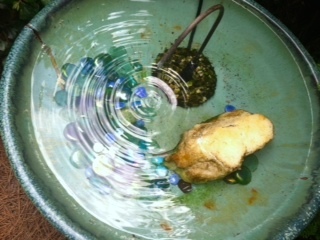 Adding a large rock or stones to your birdbath helps birds. It’s absolutely true, especially for juveniles venturing out into the world after springs’ nesting season. Shallow, shallow, shallow is best, with a maximum depth of 2-3 inches. If your bowl is deeper – just don’t fill it all the way. 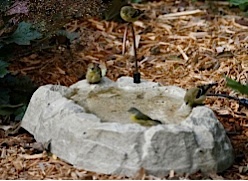 While adult birds tend to maneuver with more agility, babies can easily drown in your birdbath if the water is too deep. A recent post on this topic (on a social network) was shared far and wide because it was a good story. The person saw the bathing bird in distress, and slowly walked over with a stick, but the bird didn’t fly away – it remained in the bath struggling. When she gently extended the stick over the bath, the bird hopped right on it. After placing the stick to the ground, the bird hopped off… but could not fly. She immediately thought of a wildlife re-habber and called, but the bird eventually took flight. Drowning indeed he was, the water being too deep, with the sides of the bath too tall and steep for escape. The little guy was lucky someone was watching! Wet feathers can’t fly, this is why he hopped under the brush instead of flying to a nearby branch. 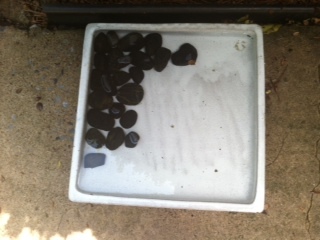 It illustrates exactly why folks are always saying to put rocks or stones in your birdbath. 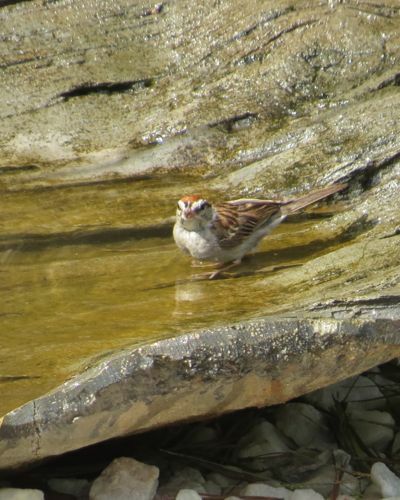 Baths with a gentle slope or walk-in sides are easiest on birds because they imitate shallow pools or puddles found in nature. Texture is always helpful too, as it allows tiny feet the ability to grip. The stones can be anything from colorful decorative ones, to a large natural rock, river rock, lava rock, or simply stones from the garden. Anything that allows birds to “hop up onto” will be used and appreciated by feathered friends. For better footing, landing and perching spots… and maybe even to save a life! One of the oldest and most intense arguments… cats vs. birds and there’s basically two sides; birders and the people they refer to as “cat crazies”- those who let their cats roam because they believe it’s good for them. Ferals who roam are a problem for birds (but that stems from human ignorance too). Still, there are birders who are responsible cat owners and keep their feline friends indoors. We fit this category – four cats, whose outdoor time consists of a screened porch, and they’re pretty happy with the arrangement. The neighbor “rescues” cats from the shelter, but they stay outdoors for the most part, which drives me bonkers! At times it’s infuriating, heated words have been exchanged on several occasions. The husband says “just shoot the cat”, but truth be told, I’d rather shoot the wife because it’s not the cats’ fault! Suggesting the cat sport a collar with a bell worked, but it really doesn’t help the birds too much. 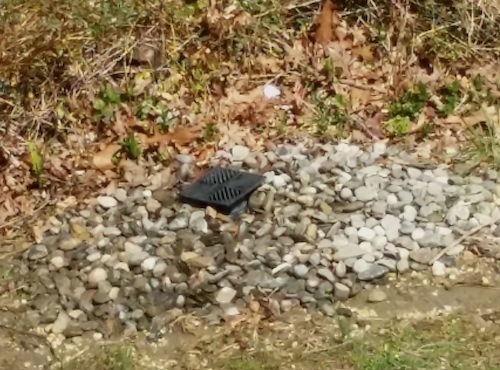 A couple of cool ground bird baths are always in use around our yard, but they’re not on the ground anymore! This stinks because birds tend to bathe more naturally at this level. 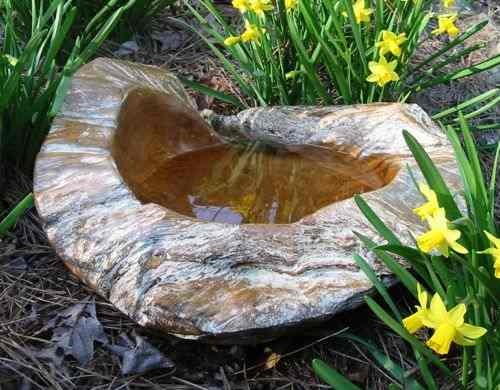 Enter tree stumps, large planters, small tables, and anything else that will add height to the bird baths. An excuse to add yet another, hanging style too. 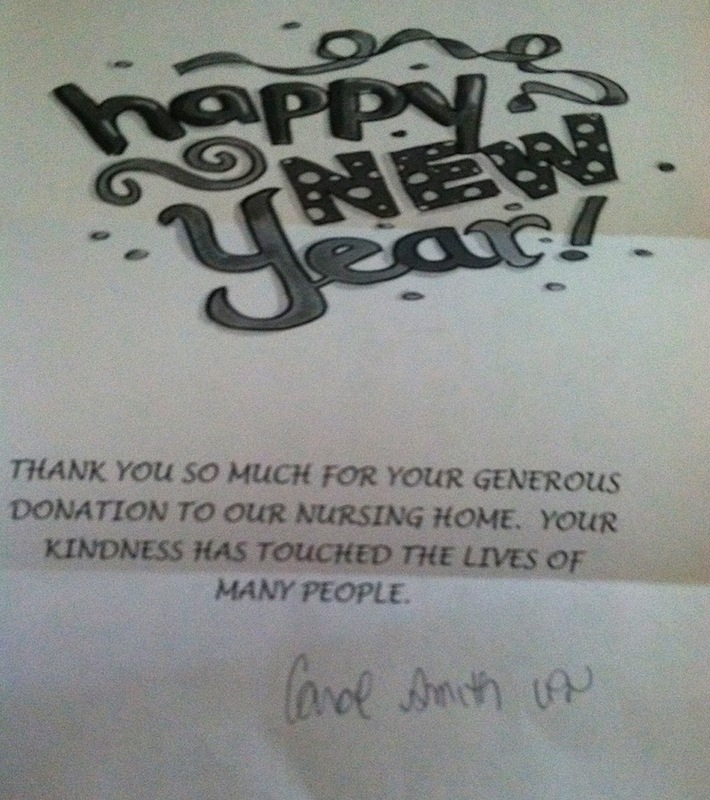 On the last day of 2013 it was nice to receive this note via snail mail. It was a thank you which stemmed from a resident’s simple request for a birdbath to attract some birds at the nursing home. We sent along one of the hanging bird baths, a couple of suet cakes with cages, and some easy suet recipes in hopes the kitchen staff might humor the residents – and help feed the birds on a tiny budget! A post was published hoping some other birding businesses might catch wind of the simple request. A couple of benches would’ve been really nice for the folks to sit outside and enjoy the birds, but that was beyond our realm. It was just good to give, expecting nothing in return, and we managed a good bit of that for 2013, and will continue to do so in the new year! 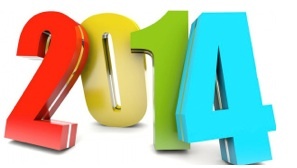 Yes, 2013 had its ups and downs, from Fiscal Cliffs and natural disasters, to super storms, a never-ending winter, and government shut-downs. The Monarch migration was a bust, and bats and bees continue to perish at alarming rates. That last part may not sound very important… but just ask a farmer who grows crops. Without these pollinators the future could be grim. May winter be swift, for early nest starts and spring bulbs forcing through, for a safe and timely return of hummingbirds and all migratory birds, for a new awareness and stewardship of the nature around us, and for many happy & healthy fledges for all our feathered friends! 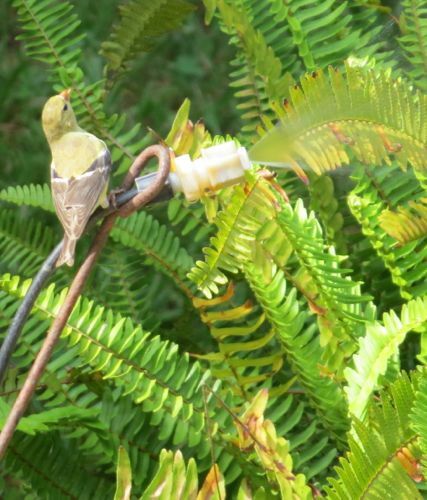 There’s really only one rule when it comes to enticing birds with water… keeping it fresh! 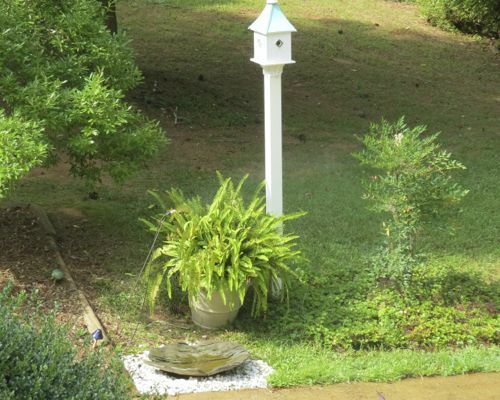 Bird Baths of all sizes and shapes are known to attract and keep birds coming back, in fact it’s the easiest way to attract them. Although depth is also important (optimal is 2-3 inches) a large rock may always be placed in the bath for safe perching should the bowl be deeper. And there’s absolutely no rule that says you must fill it to the top! Especially in summer, when lots of fledgelings are around, shallow bird baths are safest for all. This mini-bath is a fun way to offer fresh water because it has lots of perching spots. Vibrant stained glass (in six designs) catches light beautifully, and best of all, it can be used as feeder in winter months. Is it too small for a bath? Nope… we’ve seen titmice and chickadees drinking from ant moats! When used as a dish feeder, these mini-baths will accommodate a great variety of treats too. Seed mixes, suet & nuggets, shelled or whole peanuts, fruit, even mealworms if you’re so inclined! Shown in the bluebird style, there’s a hummingbird, butterfly, lady bug, dragonfly and bumble bee too. 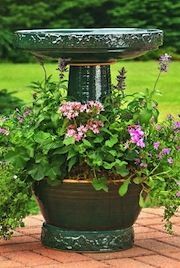 Each in vibrant stained glass and copper, these pint-sized bird baths are excellent for small spaces like on the deck, patio… or even the apartment balcony! Bold colors in the landscape can be lovely, be it flowers, statuary, or even a vibrant birdbath. But some gardens may better lend themselves to a more natural style, maybe a soothing zen-like appearance. These results are best achieved when using materials found in nature to create the space. These most unusual teak bird baths fit the bill perfectly when more quiet surroundings are desired. Available in small or large, they may be placed directly on the ground, deck or patio, or raised using a nice planter or iron stand. 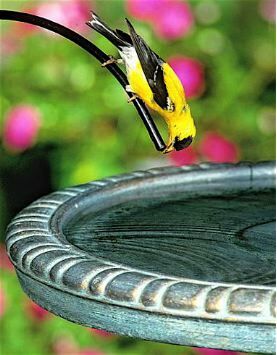 Birds do tend to bathe more naturally at ground level, but you can bet that fresh water is always welcome at any level. Teak you say? Yes! It’s one of the most dense and durable woods available. You know that fine teak patio furniture (that costs a fortune) it’s made for outside and to withstand the elements. 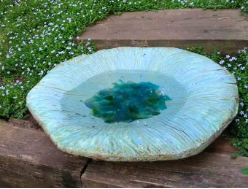 Made from reclaimed teak, these bird baths are sanded and polished to further protect them over the years. They’re beautiful in the landscape and no two baths are exactly the same. The generous thickness of the bowl and texture offers birds good footing and lots of perching spots too. Although some of these bird baths are 5 to 7 inches tall, we recommend a water depth of just 2 to 3 inches for bird’s safety… especially this time of year when lots of babies start fledging the nest!